We all have that friend—the one who inspires us to treat our bodies well, eat nutrient-rich foods, and get more sleep; they even offer up remedies for anxiety. I know I have a few, one being out wellness editor, Victoria. Thanks to her knowledge and dedication to wellness, I have been able to tweak my lifestyle so I feel better in my body every single day. She even had me eating vegan for a week. Though that didn't last—my energy responds better to lean protein and most cold-water fish—I am endlessly thankful for her persistence. As such, I think it's about time I gift her with a few goodies she'll love for the holidays. I'm sure you feel the same way about your own health-conscious friend. To help you (and myself), I made a list of every possible healthy gift that came my way, hoping to spark a few good ideas. Every single item is The/Thirty-approved, as each one offers up something helpful in the way of wellness—whether it be supplements, fitness accessories, self-care tools, or adaptogenic herbs. Below, find our favorites and do a bit of research on each for the people on your list. We're sure you're going to love it. 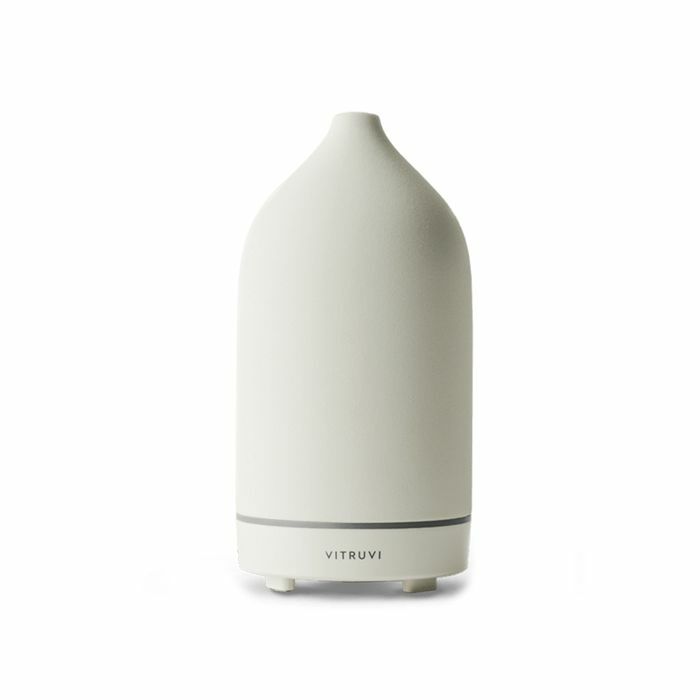 "I never thought I’d be an essential-oil devotee, but here I am, shaking my essential oil in your face and vowing it actually works," Faith Xue said of Vitruvi's Stone Diffuser. And, I felt exactly the same way. Just as she imparted her essential oil wisdom on to me, you can do the same to one of the friends that'll appreciate it most. Since lavender is scientifically proven to help you relax and de-stress, it's the perfect diffuser option to include in the gift. It'll help your friend sleep, unwind, and add some much-needed zen to their life. For someone who's new to healthy cooking (or, like me, cooking in general), it's so helpful to have a great cookbook to refer to on nights in. The debut cookbook from Jessica Koslow, the chef at L.A.’s ever-popular restaurant Sqirl, features more than 100 fresh, market-driven, healthy, and flavorful recipes. They're health-conscious but delicious. It's suitable for vegetarians, vegans, or whomever your friend may be sharing their meal with. Girlfriend Collective is an athletic-wear brand which focuses on humane manufacturing and sustainable materials. Made using recycled water bottles, this particular bra (the Red Ochre is our favorite) is especially supportive and made from a sweat-wicking, breathable fabric with four-way stretch. CBD has gained a lot of traction in the wellness space for its restorative benefits. Lord Jones's body lotion offers up shea butter for fatty acids and natural vitamins, full-spectrum CBD oil to soothe pain and calm your mind and body, as well as menthyl ethylamido oxalate for a long-lasting cooling effect to support blood flow and targeted relief. Since the holidays are the perfect time to indulge in some seasonal hot chocolate, opt for Moon Juice's version. Along with decadent cocoa, the mix includes Tocos to nourish your skin, ashwagandha for stress relief, Shatavari to support sexual health, and reishi to support a healthy immune system. It tastes incredible, and it makes your body feel even better. Hell, buy one for yourself too. It's that good. Try this lightweight, super-soft textured bathrobe for a night (or two, or three) of self-care. You friend will throw it on for some TLC, whether that means watching Netflix with a face mask, taking a luxurious bath, steeping their hair with a hydrating treatment, cooking dinner, or journaling. Plus, you can throw it in with the rest of your laundry, no problem. With bergamot and vetiver, Sandoval's Alchemy candle is warm and earthy. It's meant to inspire thoughts of "the golden age of the California bohemian," according to the brand, including California’s native plants, like lavender, spicy black pepper, nutmeg, and fresh geranium oils. Not only is the scent amazing, but this jar also contains a crystal that has been charged under the full moon with positive intentions. Seriously. Supplements have been booming as part of the wellness industry, and probiotics have gained exceptional popularity. But until Seed, I wasn't ever really sure what taking them meant or how it was going to affect my body in a tangible way. According to Seed co-founder Ara Katz, your gastrointestinal system is entirely connected to the rest of your body, as it sits at the core of it all. "It's connected to and influences everything from immunity and metabolic function to cardiovascular, skin, and urogenital health," Katz says, adding that though transient microbes and probiotics do a lot of things, one of the helpful effects as far as bloat is concerned is that they trigger neurotransmitters that stimulate muscle contractions (and easier bowel movements). These bacteria also produce butyrate, a byproduct with powerful anti-inflammatory effects. Let me tell you, the results are real and noticeable. Because Katz is so knowledgeable and immerses herself scientific proof and helpful studies, she's entirely trustworthy. Gift any friend who's been looking for the right supplement with this. These gummies have changed my life—offering deep, restful sleep each night when I used to toss and turn. They're a blend of melatonin, L-theanine, and botanicals like chamomile and lemon balm, which are meant to help boost your natural sleep hormone, encourage a calm feeling, and support a healthy sleep cycle. I take them about 30 minutes before I want to be asleep, and they work. Every single time. For anyone who has trouble sleeping but doesn't want to get into prescription medication. If you have a friend who tosses and turns because of anxiety or a racing mind. It isn't a hard-core medication by any means. It won't force you to sleep or make you feel groggy and weird in the morning. Instead, it's just a very calming feeling that washes over you and eases you to sleep when you're ready. Changing my diet and prioritizing real foods over processed meals changed everything. A huge part of that was Carrington Farms' absolutely delicious ghee. Ghee, or clarified butter, is milk fat rendered after butter separates from the milk solids and water found in an average unsalted stick. If you have a friend who is sensitive to dairy, ghee is a great alternative to regular butter because it is stripped from milk solids during the clarification process, leaving only healthy butter fats behind. It's rich in butyric acid as well, a short-chain fatty acid that helps keep your digestion on track and can decrease inflammation. Plus, it tastes delicious. Outdoor Voices' cuddly and functional fleece is made recycled wool and will keep your friend warm on the way to and from a workout, at home, and out for breakfast. It runs a bit large, so take that into consideration when you're ordering, but we like to think the oversize fit is perfect for added coziness. Your friend will love it. Volar's calming body essence is my go-to when I'm feeling the stress of work, relationships, or just life in general. Gift your friend with it so they can take a long, luxurious shower, turn on some music, and lather their body in the stuff. It's made from lavender, peppermint, and patchouli essential oils and very literally keeps your body tingling for well after application. It's good vibes, through and through. Included in Sakara's newest set is three of the most popular products the brand has to offer, and certainly a favorite here at Byrdie HQ. First, the Beauty Chocolates, a blend of plant-based, gluten-free phytoceramides to replenish your skin's moisture (and offer up the perfect bite of dark chocolate before bed). Then, there's the Beauty Water Concentrates, which offer up calming, organic rose water and beauty minerals to support collagen, as well as a caffeine-free tea blend with 14 botanical ingredients to dissolve stress and boost immunity. Any wellness-loving person will be so grateful to dig right in. Adaptogens have roots in traditional Chinese medicine (TCM) and work to regulate your cortisol levels (your body's stress hormone) to help with digestion; calm anxiety; and boost energy, mood, and even weight loss. This one, in particular, Sun Potion Mucuna Pruriens Powder ($27), contains 15% L-dopa, a naturally occurring amino acid that transforms into dopamine in your brain. Dopamine is a neurotransmitter that allows for more dynamic functioning of the brain, and higher levels of dopamine have been linked to enhanced brain function, elevated mood and energy levels, and a more balanced nervous system. Even the most health-conscious, wellness-committed people get a little sauced over the holidays. It's tradition, and life is about balance. This transdermal patch helps replenish what you lost after a night of drinking using hemp extract, vitamin B1, and green tea extract to address the symptoms of a hangover. FYI: I tried 50 November Sephora launches—these are my eight favorites.